Good Evening! I hope this finds you all home and relaxing after a hard day at work! Maybe you just had dinner, maybe you are waiting for your water to boil, your oven to heat, or your microwave to ding, regardless, I have you covered for dessert. Or wait.....I mean breakfast, umm, tomorrow. These "muffins" taste more like dessert but.......shhhh, don't tell anyone. I have never eaten a chocolate muffin. Never. Can you believe it? My husband says it is because chocolate muffins are cupcakes. And heaven knows, I have had my fair share of those so technically, hubby says, I have eaten chocolate muffins. Well since I am on another use up kick, I had some cherry pie filling, some maraschino cherries and other random things I wanted used up. You got the final deal here. I mean who doesn't think, "Heck yeah" when they hear Chocolate Covered Cherry Muffins? I am on a bit of a muffin kick anyway, it is turning into another biscotti obsession of how many kinds can I possibly make. Has this ever happened to anyone else, or am I, again, the singular freak? These muffins aren't to sweet, they have a nice texture and who doesn't love a surprise cherry in the middle? Get outta here, they are delish. DO NOT and I repeat, DO NOT, skip the chocolate drizzle on top. It evens things out perfectly and just shouldn't be left out. Get in your kitchen and make these, because every morning should start so decadently! Preheat your oven to 400 degrees. 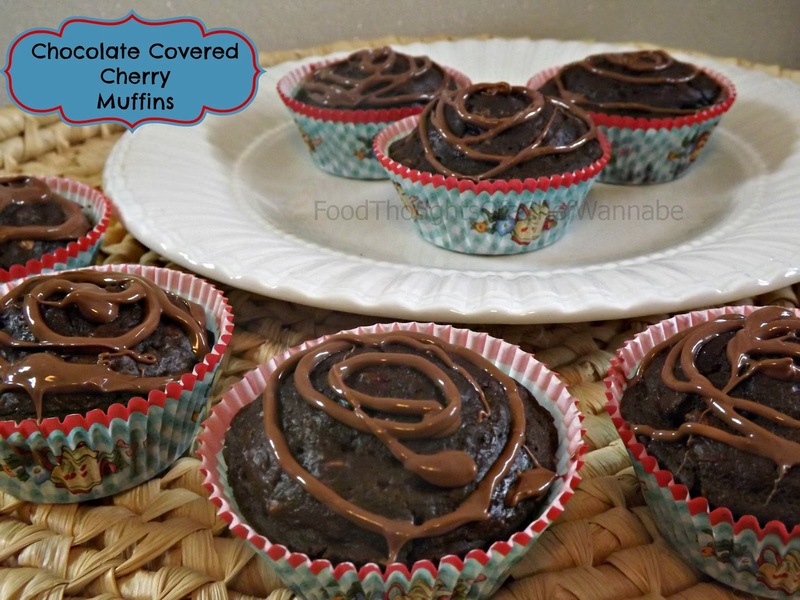 Line muffin/cupcake pan with liners or spray with nonstick cooking spray and set aside. In a large bowl or your stand mixer bowl, add in eggs, butter, buttermilk brown sugar, baking powder, baking soda, salt and cherry extract. Mix until all ingredients are well combined. Continue by adding cherry pie filling and oats to the mix. Again mix until all ingredients are combined. Add in flour and mix ONLY until flour is absorbed. Using a rubber spatula scrape down the sides and fold in chocolate chips. Fill openings of your muffin tin about 2/3rds full. You should get 15 muffins. OK, I got 15 muffins, you might get 14, or 16 but, you just go with whatcha know.......! Place a maraschino cherry on top of each muffin in the center. Most of the cherries will sink to the middle, some might stay closer to the top. No matter, bake for 18-20 minutes. Remove and let cool completely IN the pan. Put chocolate chips in a small Ziploc bag, and microwave 30 seconds at a time until chips are melted. Cut a TINY bit from the corner and drizzle the tops of the muffins however you want. Let the chocolate set and serve!